Primula plants and species such as primula auricula, primula veris and primula vulgaris all grow well in a free draining humus rich soil. A slow release fertilizer early in spring or some liquid seaweed fertilizer will help promote growth. Primula Veris is the species known as ‘Cowslip’ and is well known for its yellow flowers, however many interesting species are also available for sale. Look for Primula allionii species and cultivars for something a little different. 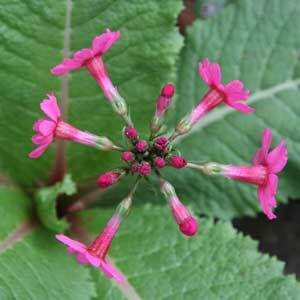 Candelabra primula plants have the flowers rising above the foliage, ‘like a candelabra’ . Primula japonica ‘pink pagoda’ is pictured right. Primula are a cottage garden favourite. With over 400 species of primula a general growing guide is to provide a moist, shady position, humus rich soil and don’t let primulas dry out during summer. If you are looking for something really spectacular, the rare Primula vialli or ‘Orchid Primrose’ is worth seeking out at rare plant fairs, purple flowers in spikes, unusual. Widely grown perennials Primula are often referred to as primroses. The genus Primula actually has around 450 species, so variety is incredible. Growing well in temperate woodland areas these late winter to spring flowering plants are a colourful addition to the garden and are also suited to growing in pots or containers. With many hybrids available colour range and flower form is greatly varied. Some species and cultivars have flowers that are help well above the foliage while others are held down amongst the foliage. Primula auricula is a species known as the mountain cowslip. However the hybrids known as ‘auriculas’ can be divided into four main sections these being Show, Alpine, Double and Border. Primula can be a little fussy when it comes to care, they do not like dry conditions and they do not like it wet either, especially over winter, except for the bob primulas that is. And of course we also have polyanthus, Auriculas and Candelabra. However things are pretty much the same for most of them. If you are growing them in the garden, and we do, you need to find a position that gets good light but not hot afternoon sun. So morning sun afternoon shade or dappled shade are the best light conditions. Next step is the soil, it needs to be rich and moisture retentive, but not wet. So if you have sandy soil consider digging in a good quantity of well rotted compost and maybe some coco peat (coir peat). This will help retain moisture while allowing good drainage. These plants will flower in spring and they do need a cool position especially in the Australian climate. As they appear in spring water with a liquid seaweed fertiliser, you can use a slow release type as well if you wish, they are heavy feeders. Choose a position in part shade, more shade in hotter climates. Prepare the soil with lots of organic matter and some aged cow or sheep manure. keep moist yet well drained. Fertilise with a good organic fertiliser, and top dress with some well rotted compost, blood and bone and cow manure in spring. Divide every 3 – 4 years. If you have a wet winter and the soil becomes boggy the plants may well rot. If allowed to dry out even when dormant you can also lose them. We have grown these wonderful plants for years, lots of compost and we top up every year. Specializing in Hellebores, species Paeonia and Auricula. Order online April – Sept, or can grow to order.